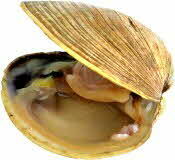 Clams can be frozen either in the shell or shucked. To freeze the clams in the shell, place the live clams in moisture-vapor resistant bags. Press out excess air and freeze. To freeze the clam meat, shuck the clams, then clean and wash the meat thoroughly. Drain and pack in freezer containers, leaving 1/2-inch headspace. Seal, label and freeze.